In 1900, it was one of the colonial powers fighting outraged Chinese nationalists waging the Boxer Rebellion. 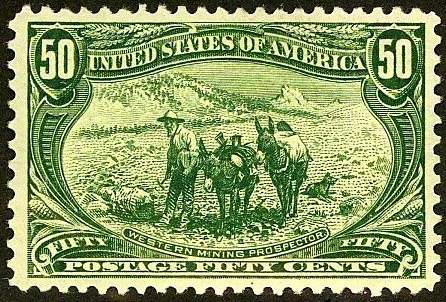 During this time of upheaval, two different 10 pfennig stamps were locally hand-stamped "5 pf" in order to meet a shortage of this denomination (Scott #16,16a). These stamps are distinguished from one another by the angle of the black "China" overprint (56 degrees for #16, and 45 degrees for #16a). 2,500 of #16 and 1,400 of #16a were issued, and Scott '14 prices them unused at $600.- and $550.- , respectively. As with most valuable overprinted stamps, I strongly advise purchasing them conditional on obtaining expertization. I favor all better stamps of the various foreign offices in China long-term investments. As with all stamps issued by the colonial powers in China, the Foochow Provisionals stamps have been neglected because the Chinese view them as shameful relics of that period of subjugation, which they are. 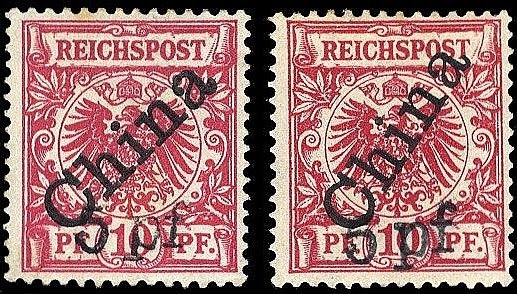 Until reticence replaces resentment and demand for the Foreign Offices is boosted among Chinese collectors, the stamps' values will probably continue to increase steadily, based on collector demand in Germany.